I’ve finally got round to creating my first blog. I have been meaning to do this for years, but have always felt I wouldn’t have the time to maintain it. I plan to use this blog mainly as a space for me to catalogue my knitting and crochet projects. I’ve been knitting for about 8 years, and crocheting for 3. I’m a sporadic knitter – I go through phases of frantic knitting, planning projects, buying vast quantities of yarn, trying out lots of design ideas (this can have an almost manic quality! ), then periods where I will hardly pick up a hook or needle. I am currently going through the former – hence the decision to start the blog. The weather’s getting cold and I need warm clothes! 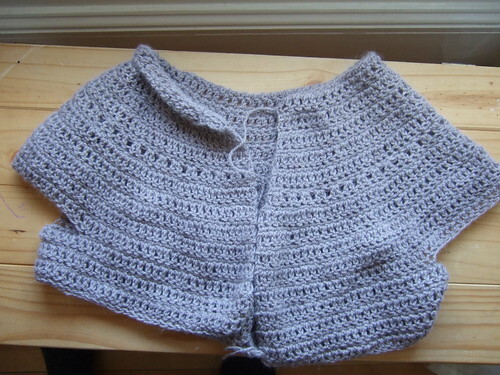 I tend not to knit or crochet clothes for myself as adult cardigans and jumpers take so long, and I am often not happy with the results (they usually end up frogged or given to charity). I mainly stick to small things – socks, scarves, hats etc as they take less time, and it’s not such a big deal if I am not happy with the results. This year however I have 3 sweaters/cardigans lined up – all for me. Two are currently in progress, the other is just in my head at the moment. They are all crocheted so hopefully I will finish them before I get bored with them. The first is a top down round yoke cardigan I’m making with yarn I got at this year’s knitting and stitching show at Alexandra Palace. It’s DK weight alpaca yarn from Teo Handspun from the Isle of Skye. 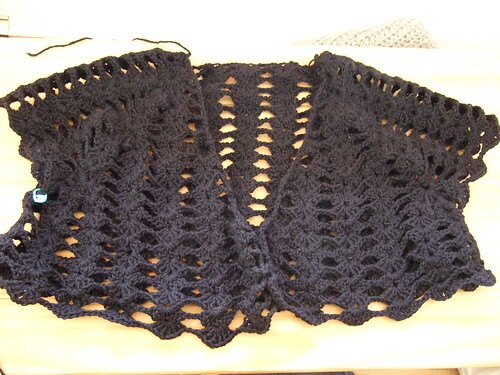 The pattern is designed using knitware software (free demo version available here). This would have been finished by now had I not started this. 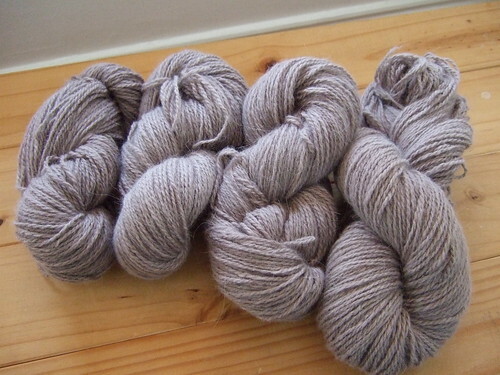 I’m using Colourmart angora/wool DK weight which is very soft and a pleasure to work with. The third project will be a cowl neck hip length mohair sweater with 3/4 lenth sleeves – I’m still working on the pattern for this and will try not to start it until I have finshed the first two.